BLAST for beginners introduces students to blastn, a commonly used tool for comparing nucleotide sequences (DNA and RNA). This popular tutorial shows how to do a blast search with a nucleotide sequence, highlights information in the search results, and shows how to interpret the E value and alignment scores. The BLAST for beginners tutorial. A set of unknown sequences. A set of questions for students to answer. Instructors may purchase an updated answer key from our TpT store or download a free copy by signing up for a Digital World Biology educator account. 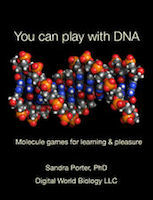 Available as an interactive text with animations and videos in the iTunes Book store and as a PDF at our TpT store. Funding for this project was provided by the National Science Foundation's Course, Curriculum, and Laboratory Improvement Program under grants DUE-0088153, DUE-0127599, from Bio-Link, an NSF Advanced Technology Education Center, and from the AC2 Bio-Link Regional Center. ***We updated both the BLAST tutorial and the Blasting through the kingdom of life activity.